A knish is a German, Eastern European, and Yiddish snack food made popular in North America by Jewish immigrants, eaten widely by Jewish and non-Jewish peoples alike. 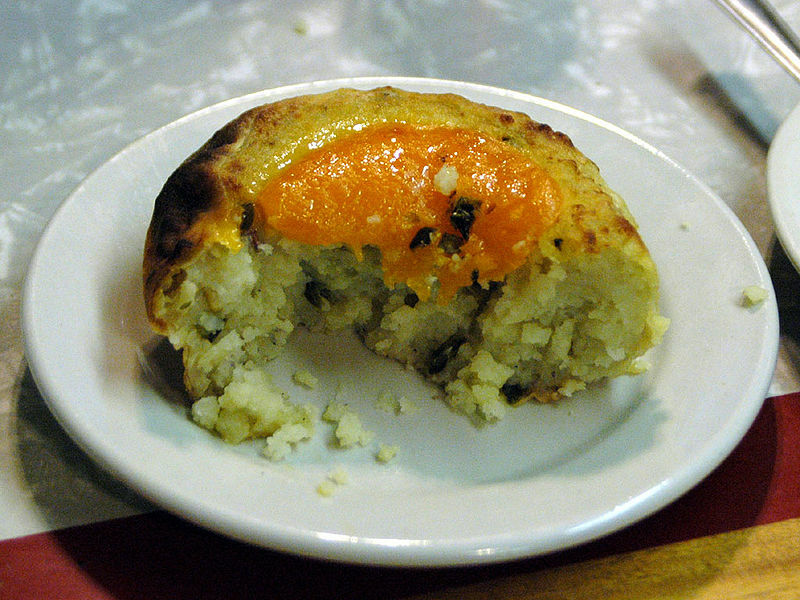 A knish consists of a filling covered with dough that is either baked, grilled, or deep fried. Knishes can be purchased from street vendors in urban areas with a large Jewish population, sometimes at a hot dog stand. In the most traditional versions, the filling is made entirely of mashed potato, ground meat, sauerkraut, onions, kasha (buckwheat groats) or cheese. More modern varieties of fillings feature sweet potatoes, black beans, fruit, broccoli, tofu or spinach. Many cultures have variations on baked, grilled, or fried dough-covered snacks similar to the knish: the Cornish pasty, the Jamaican patty, the Spanish and Latin American empanada, the Portuguese rissole, the Italian calzone, the South Asian samosa, and the Russian pirozhki. Knishes may be round, rectangular or square. They may be entirely covered in dough or some of the filling may peek out of the top. Sizes range from those that can be eaten in a single bite hors d'oeuvre to sandwich-sized.